I'm glad I had my camera on me while I was driving through the city the other day. I thought a shot like this might be useful to some visitors who use my footage for documentary purposes. 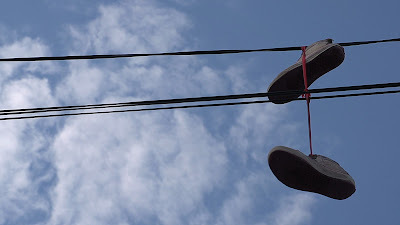 The "shoes on a power line" shot is a nice way to depict both rural and urban area adolescent culture. I also really appreciate having clips in my toolbox that make good use of negative space. I find it to be very helpful if you need something for an opening sequence, titles, or credits. Wow this is nice shot in power line shoe. Amazing Your job is good.....! Thanks! I used a bunch of your clips in a youtube upload and it looks great. Love to see the video if you have time to share it! Thanks for the comment. Thanks for the stadium clip. It's perfect for the sci-fi iMovie I'm making. Thanks. Your shots are really going to help me out. Great footage. I'm thinking about using some of your clips in my video clip. Thanks a lot for sharing. Beautiful, poetic, funny - great stuff and well worth a donation! Cheers!